WASHINGTON, DC, December 18, 2009 (ENS) – The condition of 56 percent of the lakes in the United States is rated as good and the remaining 44 percent are in fair or poor condition, according to a draft study released by today by the U.S. Environmental Protection Agency. A total of 1,028 lakes were randomly sampled during 2007 by states, tribes and EPA in a study that was the first time the EPA has used a nationally consistent approach to survey the ecological and water quality of lakes. The survey results represent the state of nearly 50,000 natural and human-made lakes that are greater than 10 acres in area and over three feet deep. “This survey serves as a first step in evaluating the success of efforts to protect, preserve, and restore the quality of our nation’s lakes,” said Peter Silva, assistant administrator for EPA’s Office of Water. Future surveys will be able to track changes in lake water quality over time and advance our understanding of important regional and national patterns in lake water quality,” he said. The National Lakes Assessment reveals that degraded lakeshore habitat, rated poor in 36 percent of lakes, was the most significant of the problems assessed. Removal of trees and shrubs and construction of docks, marinas, homes and other structures along shorelines all contribute to degraded lakeshore habitat. 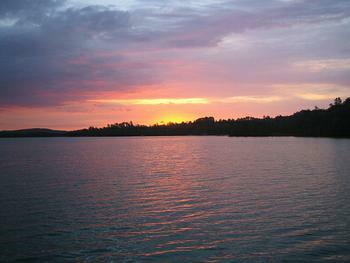 Nitrogen and phosphorous are found at high levels in 20 percent of lakes. Excess levels of these nutrients contribute to algae blooms, weed growth, reduced water clarity, and other lake problems. Silva says the EPA is very concerned about the adverse impacts of nutrients on aquatic life, drinking water and recreation. The agency will continue to work with states to address water quality issues through effective nutrient management. The survey included a comparison to a subset of lakes with wastewater impacts that were sampled in the 1970s. It finds that 75 percent show either improvements or no change in phosphorus levels. This suggests that the nation’s investments in wastewater treatment and other pollution control activities are working despite population increases across the country, Silva said. The study shows that natural lakes are more than 1.5 times more likely to be healthy than human-made lakes. The National Lakes Assessment conducted the first-ever national study of algal toxins in lakes. It found that microcystin – a toxin that can harm humans, pets, and wildlife – was present in about one-third of lakes and at levels of concern in one percent of lakes. A parallel study on fish tissue shows that mercury concentrations in game fish exceed health based limits in 49 percent of lakes; polychlorinated biphenyls, PCBs, at potential levels of concern are found in 17 percent of the lakes studied.